Miguel de los Santos Oliver, 13, 07181 Calvia-Palma de Mallorca, Spanje. 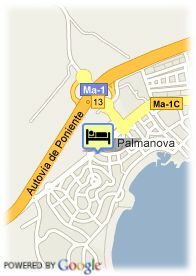 Hotel Palmanova is close to the beach and all thats happening in Palma Nova. The hotel has 210 rooms with balcony, air conditioning, TV SAT, safety box, bathroom, shower, WC. It also offers a swimming pool, a kids pool, games area, conference room, and a entertaining programm for both children and adults. Customers will be able to enjoy a wide range of water sports and golf facilites nearby. 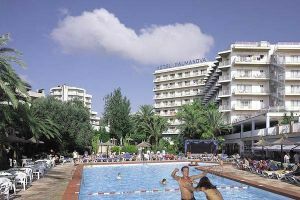 The location and informal atmosphere make it a good choice if youre looking for plenty to do on holiday - both day and night!The hotel informs that pets are not admited.